The onus on ending the use of non-recyclable plastics must be placed squarely at the door of producers and supermarkets “pushing” plastics on consumers, the Social Democrats have warned. The call from the party’s climate spokesperson, Councillor Cian O’Callaghan, comes after the launch of Repak’s Plastic Packaging Recycling Strategy earlier this month. Repak is a not for profit company set up by Irish business and owned by its members who pay fees for the amount and type of packaging they place on the Irish market. The strategy calls for producers to commit to a Plastic Pledge to reduce plastic packaging waste and help Ireland to play its part in achieving the key goals set out within the EU Circular Economy Package. At the launch of the strategy, the recycling body’s chief executive Séamus Clancy said that we need to increase plastic packaging recycling rates by up to 80 per cent to meet the new 2030 EU targets. Ireland is currently the top producer of plastic waste in Europe, producing 61kg of plastic waste per person each year. This is 9kg more than the second worst offender, Luxembourg. Cllr O’Callaghan, however, said that the EU target to eliminate the production of non-recyclable plastics by 2030 is “just not ambitious enough”. “Producers and retailers should lead the way and start phasing out now all packaging that can’t be recycled in Ireland,” he added. Repak also recently launched a Team Green project with famous ambassadors such as Roz Purcell and Paul McGrath to encourage the public to recycle more. The scheme finds that we could recycle 250 million more pieces of plastic every year if everyone recycled just one more piece of plastic per week. While the idea behind the project is “all well and good”, Cllr O’Callaghan said that consumers are annoyed by the “ceaseless tide of plastics” that is “foisted” on them in supermarkets every day. “Like many consumers, I don’t want to buy two courgettes in my local supermarket wrapped in a plastic tray and a film, both of which cannot be recycled in Ireland,” the Fingal politician said. 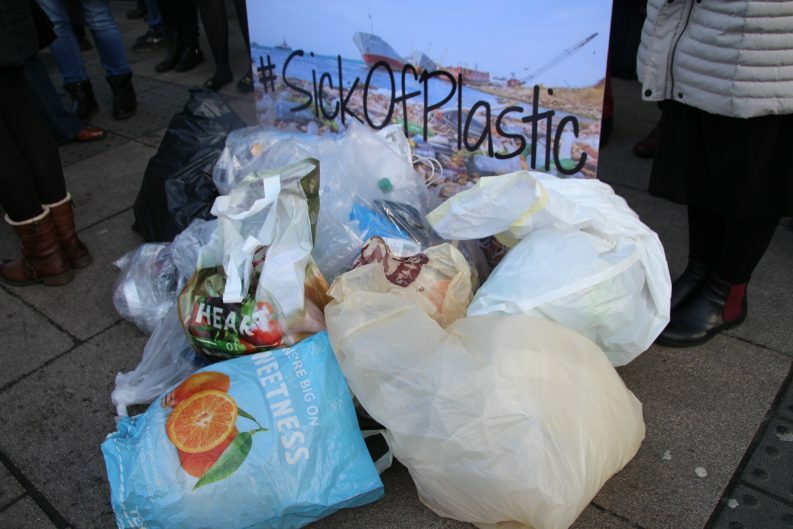 Mindy O’Brien, the coordinator of the Sick of Plastic campaign, told The Green News that consumers can send a message to producers and retailers that they “don’t want more plastic” by shopping sustainably and choosing items with no packaging or easily recyclable packaging. While recycling “has its place”, Ms O’Brien said that we need to stop looking at “end of pipe solutions” as the “panacea” to plastic packaging waste. “We must also look at how this waste is created in the first place and find effective solutions to protect products without creating unwanted and unnecessary plastic packaging,” she added. Cheap plastic composite material and hard to recycle plastic packaging should be “banned or highly taxed”, Ms O’Brien added. This will incentivise industry to make “better, more sustainable” packaging decisions, she said.